Sitting with improper posture for even just a few hours a week at work can cause neck, back and shoulder pain. Many of us sit at work for 40 hours a week. Then many of us go home and sit on the couch for a few hours after work. For these reasons, poor sitting posture is a key contributor to many orthopedic impairments. With that in mind, here are a few tips to help you sit better at work and decrease the likelihood that you will develop neck, back or shoulder pain. 1. Use a chair with lumbar support: You should have an office chair that supports the curve of your low back. If you don’t have a chair that does this, you should look into getting one. If our chair does not support the natural curves of our spine, stress is placed on our low back, which can lead to back pain. 2. Work with your elbows parallel to the floor: This means that your keyboard should be level with your elbows. By keeping your elbows parallel to the floor, this will prevent you from putting strain on your shoulders, elbows and wrists. 3. Ensure your eyes are level with the top of your computer screen; This will prevent from having to look up or down at your computer screen, thus decreasing strain on your neck. 4. Keep feet flat on the floor: This will help to keep your body in good alignment while sitting. 5. Sit back in your chair with your knees bent to 90 degrees: This will allow you to use the support that your office chair provides for lumbar support. Another thing that office workers can do to take strain off their back and neck is to get up from their chair every 20-30 minutes and walk around for a few seconds before sitting back down. This gives the joints of your back and neck a chance to change positions for a short period of time, decreasing the strain placed on these joints. 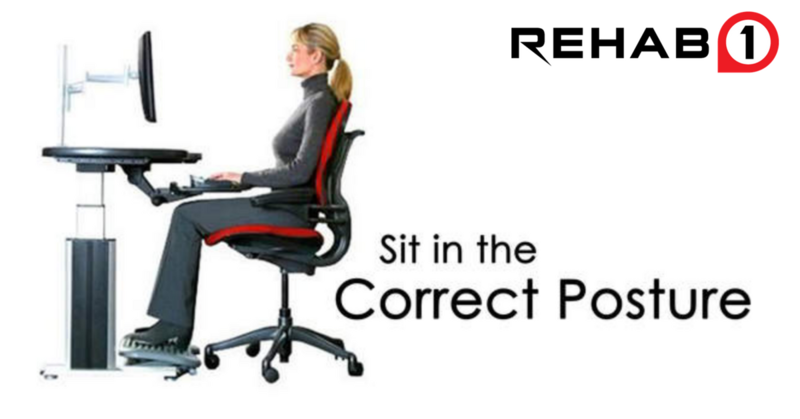 If you would like to learn some exercises and more on these tips to improve your posture, or if you believe you have an issue that is arising from your sitting posture, come to Rehab One Performance Center to see one of our experienced physiotherapists.